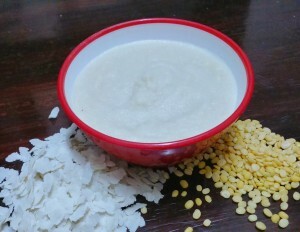 Poha or Riceflakes Porridge can be given from 6 months after introduction of all basic foods. It is an ideal Travel food for babies. How to make Poha or Riceflakes Porridge powder at home? Poha / Rice Flakes 100 g.
1. Roast Poha and Moong dal separately. 2. Grind the ingredients individually and mix thoroughly. 3. Store in a dry airtight container. The shelf life will not be affected dear. If you wash and sundry the poha and then dry roast and use it as per recipe. Nothing will get altered or changed. But taste wise there will be minuscule of difference but that will not make a huge difference. Yes, It can be given as breakfast dear. Twice in a week is fine. You can start with 2 -3 spoons and eventually upgrade as per little one’s appetite. My daughter is 2 year. Can i use red poha? Is this porridge can be given in the evening? Yes dear you can try that. I love your blog. It’s life saving . Being a doctor myself I really appreciate your comments on hygiene . And your travel series is the best . But I have one small query. How do we clean poha before roasting . Can I wash it?? Will the moisture interfere with roasting . Much love to your moppets. Thank you so much for your <3 !! Tell me which brand poha can be used..in my place I find the rice flakes a little muddy..what should I do? Hi Hema, my baby is now 10 months old. When he was 7 months I gave him Red Poha but he got allergies. So I stopped giving poha and started Sprouted Ragi. But now can I try white Poha?? As poha is good for tummy when babies have loose motion , so I want him to eat white poha. can i use this rice flakes porridge at meal time or it is breakfast ? How long should I roast the daal? I mean how can I understand it is done roasting? Can I add mashoor daal instead? In poha I see different varieties like thin, thick and medium .. Can you please tell me which variety should we use.. Also Hw long do we need to roast the poha and dal? Hi can we add salt instead of jaggery for all porridge…. Hey..so I don’t have to cook it on a stove top right ? Just add hot water and feed ? Yes Sai, just add hot water and it is done. Since it has already been dry roasted it will cook when hot water is added. Can we use jaggery without cooking?